Months of rumors become truth in minutes. Aaron Chandler and Boris Hegerty now had their hands full. The quarrymen are out of control. Meanwhile, Liberty Sand and Gravel are determined to continue closing the quarry even with an offered proposal in their grasp. Things don’t always turn out the way it should. A peaceful resolution is wanted but a riot breaks out. Seriously injured, Boris is rushed directly to surgery while his fiancee struggles to put her patients before her feelings. Jessica Malloy is first and foremost a doctor. She wants children and a husband, yet Jess has no desire to quit the job she loves–ever. The work she craves are emergencies. The thrills. The tension. The frantic pace of an emergency doctor’s life. Thus, Jess expected to remain single. Then she meets Maudie, a woman wracked with cancer, and eventually falls in love with her son. Enter in Eli Sheffler. Trained in the Navy, Eli loved his job running the ambulance and being the first to help those in need. Just as he took care of his sister so many years ago. Although he never complained about living in the orphanage, Eli remained angry about his father’s leaving. Older and much wiser, Eli was in for the shock of his life, for during the riot at the quarry, Eli comes face-to-face with his father. A twist of tales in one, The Quarry is the second book in the Firehouse Family series. With the cast of characters from Book One, Memories, the story moves steadily forward to the expected outcome of Jess finding her true love, Eli finding his long-missing father, and Boris completely recovering. Although this portion has been neatly wrapped up, it’s evident another book is in the making. With two fantastic novels under Loveman’s pen already, I hope this series continues through the final climax. Eli Sheffler is the senior First Aid man at the Woodhill Fire Department. Eli’s mother died giving birth to his sister, Ruth, who had cerebral palsy. Eli helped raise Ruth because many people did not understand her illness. Eli’s father abandoned them a few years after his wife died. They ended up in an orphanage that a friend had taken them to. Jessica Malloy is the town’s Emergency Room doctor; she is the only woman doctor in town. She also takes care of Maudie Hegerty while her son, Boris, is working at the quarry. Jessica feels herself falling in love with Boris even though there is a big age difference. Aaron Chandler is brought to Woodhill to investigate the quarry’s profitability. If the quarry can not make enough money it will be shut down, leaving many people without jobs and homes, as many of the employees live in quarry housing. He finds himself befriending Boris while trying to make safer working conditions for the quarry to keep it ope for a number of years. When the quarry is shut down by the big guns, Boris is hurt in a terrible accident. Jessica is helpless and must stand by to wait to see if he will survive. At the accident scene Eli is brought face-to-face with his long lost father. Can he set his bitterness at being abandoned aside to talk to his father and hear his story? 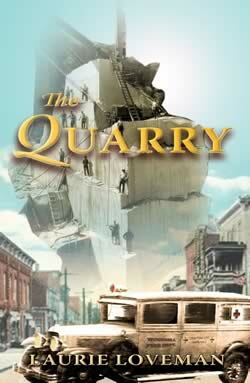 The Quarry is the second in a trilogy of the Firehouse Family series. It is set in 1934 in Woodhill, Ohio. Jessica is a compassionate woman who you want to see find her happiness. Eli wants to understand why his father never came back for him and his sister, but his anger prevents him from this. He needs Jessica to help him through his pain and overcome his bitterness. Laurie Loveman has the knack of pulling the reader in by telling a great story. It is a story that makes you fall in love with the characters as if they were your own friends and family. “Geez, I’m gonna be my own accident case,” Woodhill, Ohio Fire Chief Jake McCann exclaimed as he corrected his line of travel before he bashed the fire department’s pickup truck into an elm tree. He was attempting to steer along Lincoln Street and jot notes at the same time on a log sheet dated Monday, August 21, 1933. The windshield wipers flip-flopped, clearing rain and making a hypnotic rhythmic sound that was soothing. After drenching Cleveland, twenty miles to the northwest, the storm had arrived in Woodhill at seven in the morning, keeping the fire department busy pumping water out of basements and cutting up broken tree limbs. Even with the truck windows rolled up Jake could hear the roars, squeaks, and squeals of hand and chain saws. At the next block Jake parked a couple of houses behind Engine One, the department’s 1926 Ford pumper, and ignoring the rain since he was already soaked from earlier emergency calls, walked up to John Cochran’s house. Cochran was standing on his front porch to keep out of the rain, but craning his head around the side of his house to see what the firefighters were doing to save his garage. When Cochran saw Jake, he grabbed an open umbrella and intercepted him at the driveway. “Chief Sanderson passed away in 1926, Mr. Cochran. I believe we’ve improved the response time since then, but now is not the time to discuss it. Please get back on your porch so you don’t interfere with our work.” Cochran stopped, mouth open and ready to launch into another tirade, but Jake cut him off with a blunt, “Thank you,” and continued on alone to the back yard, where Captain Freddy Pratter was supervising the overhaul operation. “I’m gonna kill that old geezer,” Freddy growled when Jake reached him. On Belle Street, Engine Two was parked ahead of the electric company truck, whose linemen, by the very nature of the situation, had been following the 1930 Ahrens Fox pumper from place to place. Lieutenant Tom Royan was at the side of the house with the linemen, pointing to the roof where a downed wire was bouncing around trying to coil upon itself, but when he saw Jake, he started walking towards him. Jake drove back across town to the railroad bridge on Burton Road. A car had tried to drive through the underpass at the same time as a gravel truck from the quarry was coming through from the other direction. The car ended up being wedged between the underpass wall and the truck, and that accident caused another accident when a second gravel truck tipped over as the driver tried to avoid hitting the first truck by swerving away from the underpass. Hank Atkinson’s tow truck had winched the crumpled car out from the underpass and now quarry foreman Boris Hegerty and Captain Mickey Justini were looking at the wreck. The gravel truck hit by the car was parked on the south side of the underpass and looked undamaged except for having its paint scraped off. The overturned gravel truck was being righted by a front-end loader from the quarry. As Jake watched, the gravel truck settled back onto its wheels with awhump and rocked back and forth a few times before settling down. The loader operator began scraping gravel off the street and dumping it into a third truck. Jake tapped the truck horn and Mickey waved in acknowledgement. Despite his muscular six-foot-three frame, Mickey’s ruddy-cheeked baby face and sparkling blue eyes mirrored his happy-go-lucky attitude. His eyes sparkled now as he removed his helmet, allowing the rain to dampen his sandy-colored hair. In the passenger seat, Lieutenant Eli Sheffler, the senior first aid man, nodded his head in acknowledgement as he jotted notes on a form attached to a clipboard. Not getting a response, Casey glanced sideways, but Eli’s straight, light brown hair had fallen over his forehead, hiding his face. “Didja hear me?” Casey asked. Eli looked up. In contrast to Casey, whose eyes were as brilliant green as his hair was red, Eli looked almost drab. His brown eyes were very nearly the same shade as his hair. His face, while not unattractive, was pale, making him appear to be just recovering from a long illness. “All I said was I hate the quarry,” Casey protested lamely. “Well, it’s foolish. The quarry’s just a big hole in the ground and the men that work there are just plain people. There’s nothing scary about them.” That said, Eli slouched in his seat, listening to the swish-swish of the windshield wipers, and relishing the few quiet minutes before they got to the firehouse. Eli didn’t like the quarry, either, but he wasn’t about to let Casey know it. Casey angled the ambulance on Court Street in order to back into the firehouse. The three sets of bay doors were open and both fire trucks had returned. Volunteers were congregated in the ambulance’s bay, trading storm stories as they finished wiping off tools. Their voices, interspersed with raucous laughter, ricocheted off the glazed yellow block walls of the apparatus floor. Mickey hollered at them to get out of the bay, then he motioned Casey in. “That was some accident, wasn’t it?” Mickey said, walking with Eli towards the watch office at the rear of the apparatus floor. “The guy was a real jerk,” Eli answered, entering the watch office. The front was a half-wall topped with a counter. Eli sat down at the built-in desk to write his report while Mickey leaned on the counter. “Did you see how we had to pry the car apart to get him out?” Mickey asked. “What a mess,” he added happily as he sauntered over to Jake’s office, also at the rear of the apparatus floor. A plate-glass window gave Jake a view of the apparatus floor from his office, and through the window Mickey saw Jake talking on the phone, or rather, listening to someone else talking on the phone. From the way Jake’s forehead was creased in a scowl, it didn’t appear he was enjoying the conversation. Mickey flopped onto the single hard-backed oak chair across from Jake’s desk and began to write out his report. When he caught Matt Gardner’s name, he looked up and give Jake a sympathetic smile. No doubt the police chief was letting Jake know in his usual tactless way that he wasn’t pleased with something having to do with the fire department. There always seemed to be something Matt could find to complain about. Tipping his chair back on two legs as he collected his thoughts for a moment, Mickey stared past Jake at the small window that faced the alley between the firehouse and the Teller Building. With the rain, only minimal light entered, making the beige-painted walls look dirty gray. The high humidity imparted a combination of odors: grease and oil from the engines; a mustiness from damp clothing and boots. Mickey loved the smell. “If I was claustrophic, this office would have me screaming in terror,” Mickey said, although Jake wasn’t listening to him. Jake’s desk and chair, an oak filing cabinet, and the chair that Mickey was sitting on took up all the space. On the back wall were an assortment of framed firefighting photographs of the New York City Fire Department, where Jake, Freddy and Mickey had worked, and a couple of recent photographs of Jake and Laura Darvey riding Laura’s horses. Into the phone Jake said, “Yeah, Matt, I agree. Yes, I’ll be over later to discuss it. Yeah, goodbye.” He hung up and raised both hands above his head, stretching upwards as if trying to grasp something just out of reach. “Mobile radios,” Jake groaned, still stretching. The kitchen was on the far side of the dormitory, along with a linen closet and another bedroom that was currently empty since Freddy had moved into an apartment. The dormitory had six beds, three against each of the longer walls, with each separated by a chair that acted as a nightstand. They were rarely used since the volunteers usually responded to alarms right from home. In the middle of the dormitory was a brass pole protected by a circular guard rail. To their left as they entered the dormitory was the washroom and beyond that, Jake’s room, where he was living until a decent apartment was available or, as Freddy and Mickey believed, until Jake and Laura decided what they were going to do with their lives. The kitchen was half the size of the dormitory. The cooking area took up one corner, an oak table with six leaves and a dozen chairs filled the middle, and in the far corner, four beatup lounge chairs were grouped around a radio. Freddy was at the stove, dishing out something that vaguely resembled the picture on a box of noodles. At first glance, Freddy could have passed for a brother of Jake and Jake’s twin brother, Dave. Freddy’s brown hair was the same shade as Jake’s and Dave’s, and the three men were slightly under six feet tall. Unlike the McCanns, however, Freddy was of stockier build, and instead of dark brown eyes, his eyes were a piercing blue. At thirty-four, Freddy was a year older than Jake, two years older than Mickey and Eli, and ten years older than Casey. “Poison,” Freddy growled and cast a withering glance at Jake, which Jake ignored. After sixteen years’ friendship, Freddy’s threatening expressions, verbal or otherwise, made little impression on Jake or Mickey. “I had that for dinner last night,” Jake said, holding out two plates, one for himself and one for Mickey. “What is this?” Eli asked, moving his fork around the edges of the food on his plate. “Don’t worry, it’s kosher,” Freddy snapped. “I don’t care if it’s kosher, I just want to know if it’s edible,” Eli said. Underneath the table a large red and white spotted dog stretched, gave a huge yawn that ended in “hooohooommmaa,” and lazily got to her feet. Pushing her way out between Eli and Casey, the dog came over to Jake to be petted. “Not now, Hank,” Jake said, sitting down, but he petted her anyway until she got bored and moseyed over to her blanket by the exterior kitchen door.